And that may turn out to be the perfect name for it, because the entire Arctic region is controlled by competing powers, including Russia and the U.S. who are now arming themselves to the teeth. The argument is over newly thawed shipping lanes and gas ports opened up by the warming climate. In the words of Reuters News Service, they are Preparing For War . When we fired up the trusty Google translate tool for the Yamal TV news, a world of cold war planning in the cold north came into focus. Ice breakers! Military bases! Roads to nowhere (except oil exploration sites)! That good old reason to go to war – natural resources and plenty of them – was exactly what we found. Damn the melting permafrost and full speed ahead – Siberia is the richest fossil fuel source on Earth, but it was hard to get at all that oil and natural gas because it lay beneath a whole lot of ice. These riches include a potential 30% of the world’s undiscovered natural gas and over 13% of its unexplored oil. The Arctic just had its hottest summer on record in 2015, and eighty percent of the summertime ice cover has melted since 1979, so the time is right for lucrative new shipping lanes in the Arctic, as well as a handful of new Natural Gas ports. According to Stratfor security analysts, Russia will be able it to monitor the activities of other nations in the region because they control the newly exposed shipping lanes controlled by securing a geopolitical ace in the hole that no other country can claim. But if history has a lesson, it’s that when riches are in the form of oil, the US better get its slice. That makes the Superpower military buildup in the Arctic today’s biggest under-reported story. ...under-reported but not unreported. A collection of graphic depictions of claims, routes and bases in the Arctic. Russia has already filed a request for the UN to recognize its continental shelf claims in the Arctic. 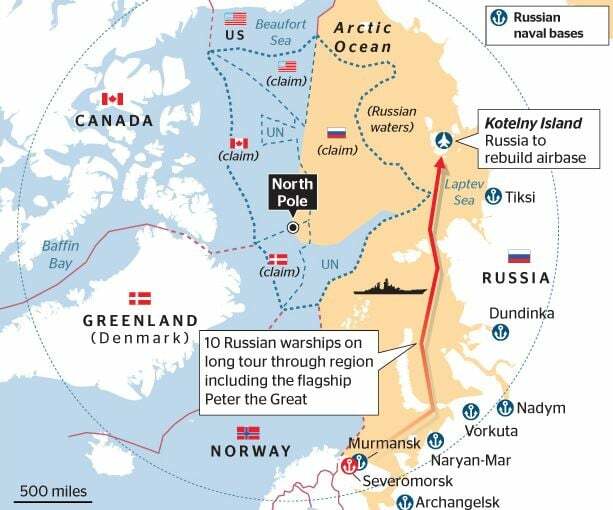 According to an article in the UK’s Telegraph newspaper, Russia’s defense ministry is planning an Arctic base that can house 150 soldiers for more than a year with no outside contact. Russian maritime war exercises in the area have been unprecedented in scale including one ‘snap exercise’ that used 80,000 soldiers and 220 aircraft. The US is hardly convinced. President Obama will be requesting resources from Congress in 2016 to fund ‘critical investments’ in icebreakers ($3 Billion for 3). Reuters reported that the US already operates 41 nuclear powered submarines that can cut through or sail under Arctic ice. And over the last 14 months, most of the 16 U.S. intelligence agencies have assigned analysts to work full time on the Arctic.